Lenore is an Ottawa-based artist who was born and raised in Newfoundland. With a Bachelor of Fine Arts (Visual Arts) from Memorial University, and a Master of Business Administration (International Business) from Carleton University, she has a passion for creating art, paired with enough business acumen to give her a range of creative and administrative skills. 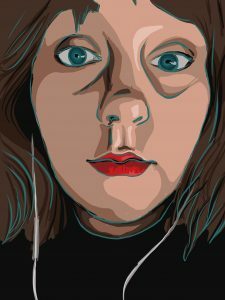 As an artist, Lenore prefers traditional media, and currently works predominantly in oil or acrylic paint to produce her work, although she likes using digital art methods to practice her drawing. People and places are fluid, constantly changing, influenced by both time and their relationships with each other. People and places have static moments in our memories, remembered in one way, when they impacted us most. I work to capture people and places from a static memory onto the canvas, trapped as they were at a time that impacted me most. I invite the viewer to contemplate these moments, as considering them can help us to understand the people and places that build us and make us who we are. To hear some of Lenore’s thoughts on being a professional and an artist, check out the blog link above.